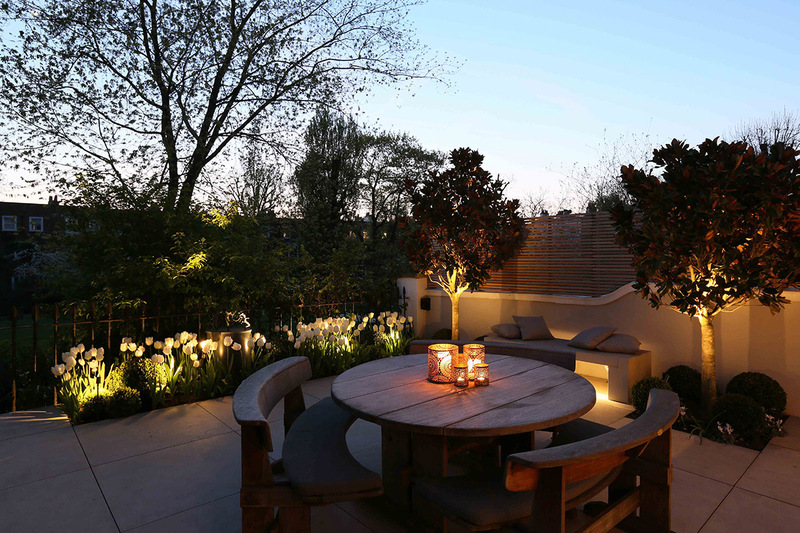 Here is our most recent project to provide you with lighting inspiration throughout the house and garden which was designed by our in-house design team using products from the John Cullen range. I am sure that you will agree that the lighting for this wonderful town house compliments the sumptuous interiors by interior designer Juliette Byrne. The lighting starts from the front door as first impressions count. 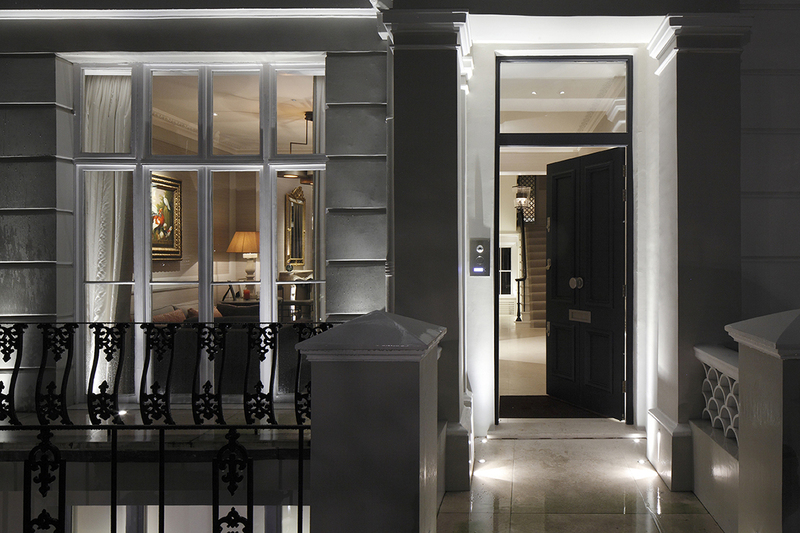 The exterior is lit up using a combination of Lucca Exterior and Torino uplights and Sirolo External floor washers. 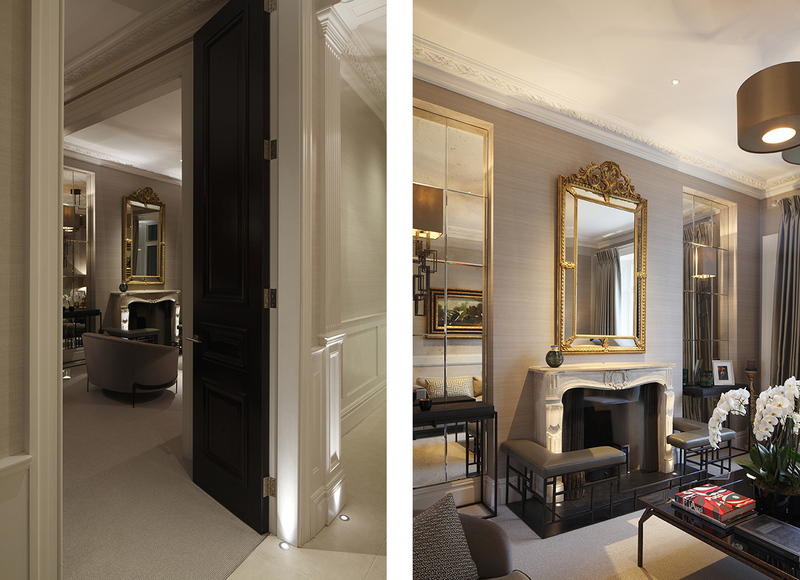 Lucca uplights are used to highlight the wonderful panelled doors and to lead you through the living rooms beyond. 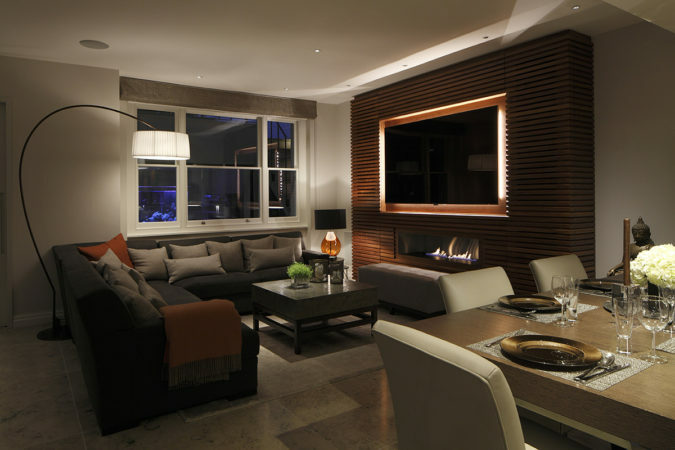 The same Lucca uplights add drama to the fire surround. Stairs down to the basement are lit using a combination of 1w Cazallas to wash light over each tread and 1w Luccas to emphasise the plaster wall. 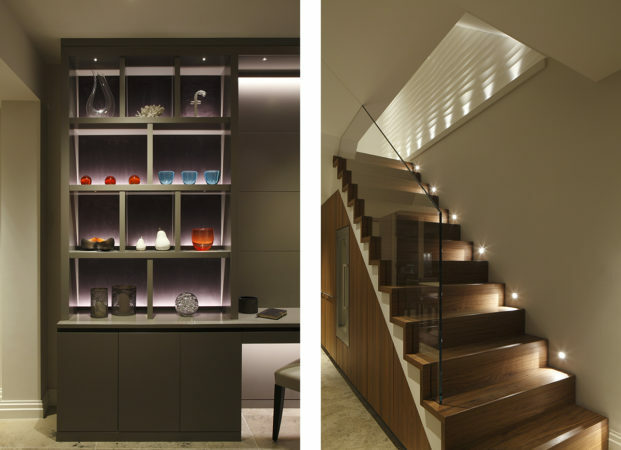 The shelving surrounding the home office is cleverly lit using a combination of Contour HD27 strip and Lucinnis. The downstairs TV area is lit using a combination of Polespring LED downlights and Contour HD27 to add drama to the media unit. 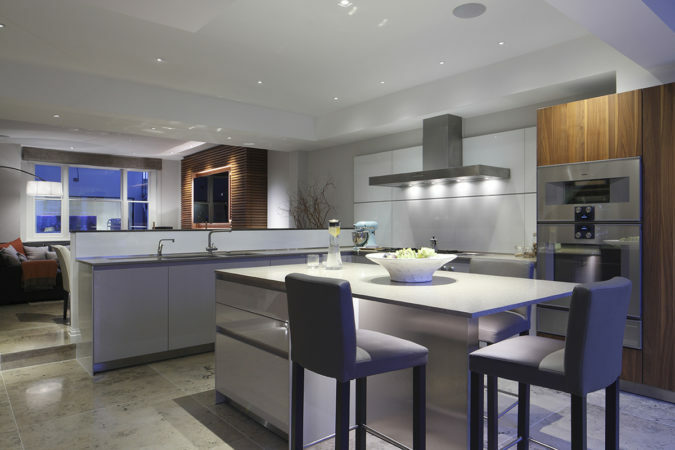 The other end of the basement contains the kitchen which is dramatically lit using a combination of Square Trimless downlights providing task light over the island, Polespring LEDs providing perimeter lighting and Contour HD27 to provide a floating effect under the seating area. A feature is made of the shoe cabinet with Contour HD27 hidden by an extrusion and Lucca uplights add a focal point for the window beyond. In the bedroom, a decorative lamp provides a diffused light whilst a discreet Cama provides the ideal bedside reading light. At low level Manhattan floor washers lead the way to the ensuite bathroom beyond. 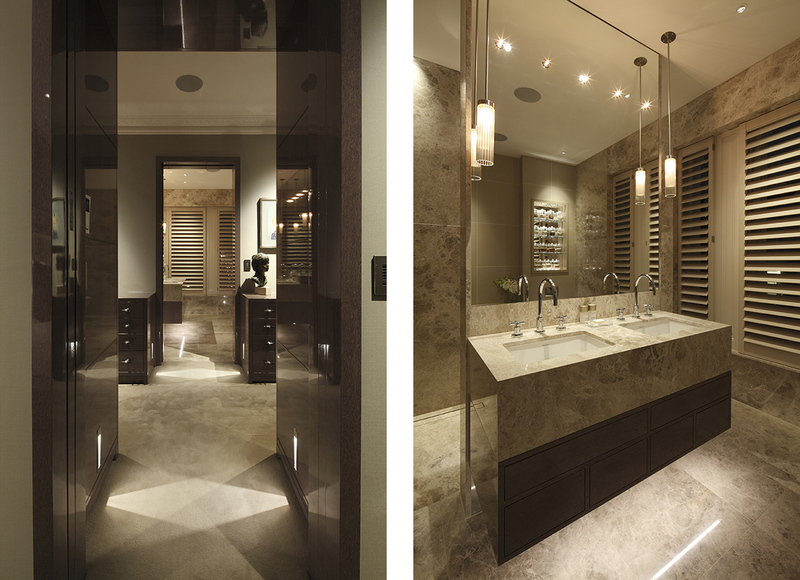 In the bathroom handmade Penne Hanging Pendants and Mini Starlights provide ideal lighting to the face over the basins and Contour HD27 with an extrusion provides an floating effect under the unit. Finally the private square garden is lit using a combination of Hampton floodlights to the planting and Kew uplights to the bay trees. At low level Contour HDX27 is used under the bench to add a layered lighting effect. For further lighting inspiration visit our Portfolio or for further work by Juliette Byrne, visit her website.